This is the story of how Westerly, Rhode Island Land Evidences helped me solve the puzzling problem of Daniel Lanphere. One of my research goals at the Family History Library a few weeks ago was to seek information about Daniel Lanphere of Westerly, Rhode Island, the father of my gggg-grandfather Russell Lamphere. I am related to him in the following way: my grandmother Edna Darling -> Russell Darling ->Emma Lamphere ->Russell Lamphere ->Russell Lamphere ->Daniel Lamphere. I’ve been doing a literature search for several years. Probate and Vital Records were not solving it. Probate records first came to my attention thanks to a mention in the Rhode Island Genealogical Register, vol. 16, Will Index, p. 174. I travelled to Westerly to view the probate file myself, as mentioned in my previous post on Daniel Lanphere. That didn’t help. This is a classic case of a probate record being a little vague and Rhode Island vital records not being complete, complicated by the fact that there are several individuals with the name Daniel Lanphere. And then I found the deeds. When I got to the Family History Library and all that microfilm, I started with the Westerly Land Evidence records I was most sure about, that mentioned Daniel and his son Russell (quite recognizable because Russell moved to Norwich/Plainfield Connecticut, and was married to Lydia, things I proved long ago). Daniel died a few months after the mortgage was granted. Russell became the Administrator of the estate. So I have clearly identified my gggg-grandfather Russell’s link to this exact Daniel. So now I know the neighbors in this era are Maxson Lanphere, David Lanphere, John Tefft, and Nicholas Vincent. There is other evidence to suggest, but not prove, that John Tefft is Daniel’s father-in-law. The next deed showed that Russell sold the property (except for the portion his mother Nancy had by widow’s rights) to Nathan F. Dixon. Here is where I got a little confused. Russell owned SIX UNDIVIDED THIRTEENTHS of the property? Why would the property be split thirteen ways? There were six children. The next entry was very startling. So the deed, above, lays out six more children of the same Daniel Lanphere. They are: George, Marcy, Jesse, Eunice, and Roda, as well as Prudence (married to Joseph Crumb). The first five sold their portion of their father’s estate to Russell Lanphere for $20 each. But I’ve never heard of any of them. I spent the afternoon wandering through the “Daniel” section of my Lanphere research binder, and my digital records of Lanphere books and documents. I knew my Daniel was married to a Nancy, so I had always assumed THIS Daniel was not my ancestor. But the children’s names match, except for the name “Marcy.” Several of the named spouses match Westerly vital records. 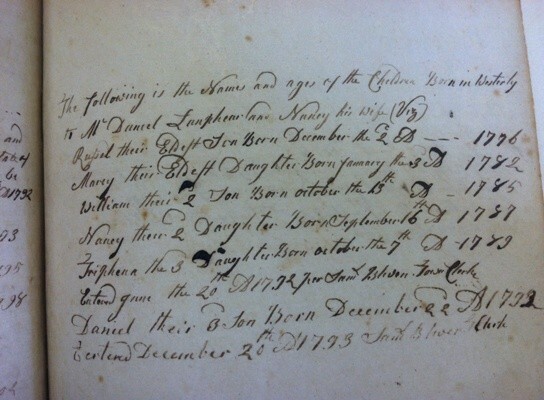 So Daniel had TWO families, one 1759-1772 and the other 1776 – 1808. To my knowledge, no one has identified these two as being the same person, with wife (1) Eunice and wife (2) Nancy. The Daniel who married Eunice (Wise? ), often called Daniel, Jr, is usually purported to be the son of Daniel (and Catherine Prosser), descended from John2 and George1. The property itself certainly seems to back up this theory, I see signs from various other deeds that I copied that it descended directly from George to John to Daniel to Daniel. Several of the neighbors are also descendants of John2. My husband, who is a Westerly native, plans to help me find the locations mentioned and pinpoint this land. And further Westerly records, and old maps, will probably clarify these relationships. I am thrilled to have made a previously unknown connection in the Lamphere line. If this had been in the probate records, I would have found it long ago. It was the deeds that showed me the story. Each of Daniel’s families seems to have a son, Daniel. I have no evidence that the first Daniel died before the second was born, so I should look for that. I have no evidence of the first wife’s death. There is no vital record for that, but I might be able to find a burial record for her. The first wife may be Eunice Wise but I do not know the real source of that information. Prove the parents of Daniel. All land records are from Westerly Land Evidences, volumes 9 – 14. The list of FHL microfilms containing these records can be found here. Westerly vital records are transcribed in James Arnold’s Vital Records of Rhode Island 1636-1850, which can all be found here – Westerly is in the second half of volume 5. Robinson, Vera M., transcribed by. “The 1774 Census of Rhode Island: Charlestown and Westerly.” Rhode Island Roots 29 (December 2003): p. 197. The Lanphere Family Research Aid by Shirley (McElroy) Bucknum. The Genealogical Society of Portland, Oregon, 1979. Re-reading her introduction just now, I see that she states there is no copyright on the book, so that it can be shared. I will try to take better pictures of the booklet in the future and put it online. For now, it is available in many genealogy libraries. The Lanphere and Related Families Genealogy by Edward Everett Lanphere. Typewritten manuscript, 1970. This is present in many genealogical library collections, but is also available at this link for subscribers to Ancestry.com. The main section, starting on page 1, is called “The Lanphere Line”. Googling that term may produce other online copies. Diane, this was quite a scholarly report. Although I got lost a bit, the last part about your discovery of Daniel having two families held my interest. I hope you are pleased with your findings, and just think of all the research to be done on Daniel’s huge family. Diane — do you know the father of Daneil Lanphere? I have solid evidence starting with George Lanphere 1631 through Shadrach Lanphere his son, to Experience Lanphere (his daughter not his wife) who married John Satterlee. George died in Westerly RI so I am assuming they are connected to your Lanphere’s but I don’t know the connection point. Experience’s siblings (Shadrach’s children) were: Joseph, Ann, Oliver, Prudence, S—, Hezekiah and Mary. The resources you list will be where I head next. Thank you! So in looking at the Lanphere and Related Families Genealogy (Ancestry.com. The Lanphere and related families genealogy [database on-line]. Provo, UT: The Generations Network, Inc., 2004. I am putting together that our connection point is with George Lanphere through his children, John Lanphere and Shadrach Lanphere, siblings. John Lanphere bequethed land to Daniel Lanphere (b 1707). Daniel’s son Daniel Married Eunice Davis and there you have it. Thank you so much for helping me make a connection point. I am very interested in their having been Sabbatarians and am looking forward to learning more about that. From what I am reading, George was adult-immersion baptized but Jane Hulet, his wife, did not complete the immersion and came up out of the water un-baptized. Fun! Hi Val. It’s likely that the Daniel Lanphere in my post is descended from Daniel — John — George but not really verified yet. I think you’ll enjoy the articles by Scott Andrew Bartley when you get a chance to get hold of them. Since you are a descendant of the Experience Read/Shadrack line, you may have found two very helpful articles by Jane Belcher in the Connecticut Nutmegger from around 2007 – “William Reed of Weymouth and Boston, Massachusetts, and Some of His Descendants”. Jane did an amazing job of putting some valuable sources together. I went through the Experience Read portion of those articles when I thought my line might be descended from Shadrack. Yes I agree the Sabbatarian link is fascinating (so Rhode Island!) and the Seventh Day Baptist Church is still there in Westerly (or possibly Ashaway). I have found some information about it here and there. Keep in touch! Thanks, Diane. I hope to get to RI some day soon! Val I hope so too. Please let me know if that happens! I’m descended from the Lanphere family, too. I love this blog; I learn so much. Thanks Val. Let me know if you ever recognize and of your Lanphere connections here. It is complicated…and follows my Forrest Gump Theory of genealogy – you just never know what you’re going to find. What actually happened is often much more bizarre than you could ever dream of happening. Keep looking for records…you never know what you will find. You now have a pretty good group of FAN club folks – find their probate and land records and see if the relationships become better defined. I totally agree Randy. What’s funny is that even for the siblings I already knew, I now know so much more that I can follow up as I enter all this into my tree. What a great (and confusing!) find and a really nice write-up and analysis. I just got back from the FHL too, where I was madly copying deeds and land transactions for my Grant ancestors in Barrington RI. I didn’t take the time to read most of them there (too many records to find and too little time to spend) but there were names that lept out at me. I hope to find some interesting bits too. Thanks Wendy and Gen Lady. Wendy I hope you find your documents to be very helpful! I still have not gone through most of what I brought home. It will take weeks. So many clues to find in land records, Diane! I’m certain that just writing up this post gave you more information or ideas for research, eh? Thanks for sharing so much about how you think through using land records with other records – so helpful. Thank you for sharing your research of the land records. It really shows how valuable they can be. thanks Celia and Cheri – and I am really a believer in land records now.